How Does The Warranty Work? Call Trevor OR Steve for more Information! We help hard working Missoulians like you move their lives forward. If you are \\\"stable\\\" in your living situation and \\\"able\\\" to pay for a car using the paycheck from your job, you meet the majority of our requirements. Bring along your driver\\\'s license to keep the government happy, and we will go to work for you. . In short, if you\\\'re honest and accurate with information you provide along with an ability to make the payment, we can have you approved and driving away within 3 to 4 hours. Electrochromic Interior Rearview Mirror: Std. Front Power Memory Seat: Opt. Load Bearing Exterior Rack: Std. Second Row Sound Controls: Opt. Third Row Removable Seat: Opt. Deals On Wheels has the best-used cars that Missoula MT has to offer. If you are looking for a slightly used, Pre-Owned automobile then you have come to the right place. Here at Deals On Wheels in Missoula, we offer "Buy Here Pay Here" auto financing to consumers in Missoula MT with bruised, damaged or just plain bad credit. Traditionally the type of used vehicles that other companies offer for "Buy Here Pay Here" consumers are cars with high mileage and late model inventory, but we offer the best used cars, trucks, vans, SUVs & sedans in Missoula MT. Bad Credit OK, Divorce OK, Repossessions OK, at Deals On Wheels we understand your situation and we can get you approved for the car, truck, van, SUV or sedan of your dreams today! If you need an auto loan in Missoula MT then you have found the right place, wither you are a first time Car buyer in Missoula MT with baby credit or have things on your credit report that are holding you back from your automotive dreams then see then come on down to see the Deals On Wheels today. The best Buy Here Pay Here Dealership that Missoula MT has to offer! Here at Deals On Wheels, you will notice that we take pride in our inventory and offer the best selection of used cars, trucks, vans, sedans, and SUVs in all of Missoula MT. We can get anyone financed who the law allows, because here at Deals On Wheels in Missoula MT, we offer BHPH (Buy Here Pay Here) automotive financing. Buy Here Pay Here (BHPH) means that Deals On Wheels (where you purchase the vehicle from) is also the same institution that will carry the note on the loan. Therefore, no bank approval is necessary to purchase a vehicle here at Deals On Wheels. If your FICO score is under 600, which would traditionally prohibit a Missoula resident from using traditional financing options, don't worry. With our 90% approval rate, we will get you approved for the car of your dreams. Most BHPH (Buy Here Pay Here) dealers stock old inventory with high mileage that will break down on you within months of your purchase and still leave you with a monthly car payment. Here at Deals On Wheels catering to Missoula MT, we specialize in late model, low mileage inventory that we run through an extremely rigorous inspection program before we stamp the Deals On Wheels name on it. Here at Deals On Wheels, we have the ability to put you into the used vehicle you want regardless of your current credit situation. With our in house financing specialists you can drive away in a great used car, even with credit problems such as unpaid medical bills, late credit card bills, charge offs, no credit, or bankruptcy. Come on down today and see why Deals On Wheels is well on its way to becoming the #1 BHPH (Buy Here Pay Here) dealership in the Missoula. Deals on Wheels is located at 1800 W Broadway, Missoula, MT 59808. 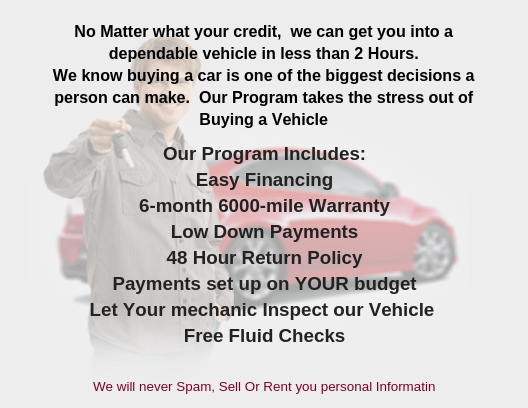 Deals on Wheels | Used BHPH Cars Missoula | Bad Credit Auto Loans has been visited 6,021,223 times. Have You Been Here Before? Welcome Back! Please Enter The Email From Your Previous Entry For Instant Access.